Tue., Dec. 27, 2011, 6:21 a.m.
WILDLIFE -- Montana wildlife photographer Jaime Johnson braved clouds of mosquitoes to snap these photos last summer in Alaska as bears converged on rivers to feast on spawning salmon. The cub (top left) seems to be content to daydream while its mother does the work of providing food for a meal. "This 2.5-year-old cub was just happy to hang out with mother while she looked for fish," he said. "Whenever mom caught one, she shared with her cub. "Oh yeah, did I mention the bugs?" 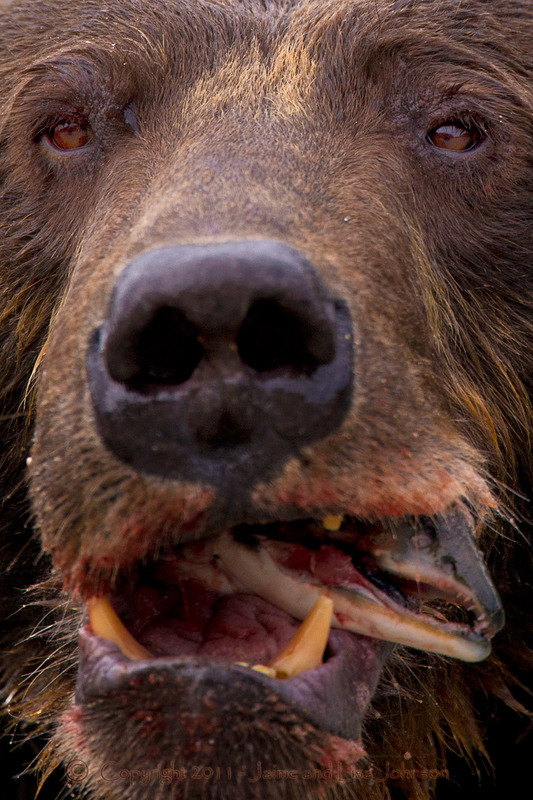 At left, Johnson captured a closeup of a grizzly getting a full deal from its meal. Perhaps the head of a salmon offers a satisfying crunch to a grizzly's dining experience, much like a crouton on a salad.